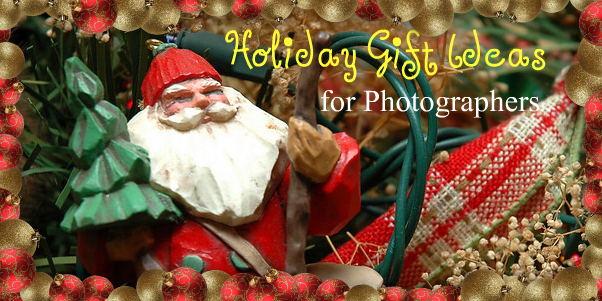 I have done this on my Disney Photography blog the last few years so I thought I would give you my picks for Holiday Gift Ideas for Photographers you know or to put on your Wish List. 🙂 Click on the links to get pricing and more information about the items. Updated on November 17, 2016. We all know how expensive photography is. Cameras and lenses can cost in the thousands of dollars. So, I did some research and found some very useful photography stuff which are very affordable. Cleaning: It is important to keep cameras and lenses clean. Here are a few things to help do that. Nikon Microfiber Cleaning Cloth – is made of soft micro-fibers and is the perfect way to safely maintain and clean your lenses, camera and binocular optics. Giottos Rocket Air Blower – the Giottos Rocket Air Blowers have an air valve to prevent it from breathing in dust and blows out a powerful stream of air to blow dust away, to make cleaning lenses, cameras, sensors, filters a breeze. Nikon Lens Pen Pro Kit – this kit contains everything you need to keep your optics clean and functional. Helps remove fingerprints, smudges and other contaminants from glass optics. Batteries and Memory: our cameras and flashes need power and a place to save all the fantastic photos we take. For batteries, I have been buying from SterlingTEK Digital Camera Accessories for years. Their batteries and other accessories are of high quality, meet or exceed manufacturer specs with great pricing. I use SanDisk memory cards and have never lost an image (knock on wood). Highly recommended. Books: whether you get them as eBooks or use the links below to the age old bounded versions, photography books are visually and mind stimulating. Understanding Exposure by Bryan Peterson – for those who have read Views Infinitum for any length of time, they have heard me recommend this book over and over. The reason? It is by far the best introduction to photography and how to use an SLR camera (digital or film). In this 4th edition, Bryan has replaced all the photographs. Not only does this give it a freshened up appearance, but two additional and invaluable subjects that have much to do with award-winning exposures: an expanded section on the ease and joy of shooting with electronic flash and shooting star trails, and a section on the use of flashlights as another tool for extremely creative in-camera exposure options. Nature & Outdoor Photography by Brenda Tharp -I reviewed the previous edition of this book earlier this year. Since then, Ms. Tharp published a new edition like Understanding Exposure to include advances in digital photography. Practical HDR by David Nightingale – this book took the mystery out of High Dynamic Range (HDR) imagery for me. Now on Version 2. I wrote about it in this review. Within the Frame by David duChemin -gear is important but, without a vision, photography can only go so far as I talked about in my review. Updated to version 2. Extreme Exposure by David Nightingale – a new book by David which I am currently reading exploring the extremes of exposure from multi-hour exposures to split-second shutter speeds AND how to do them. Filters: even with advances in photo editing software, it is still best to get it right in the camera first. Filters help to do that and these two kinds are great at it. Circular Polarizers – polarizers cut through haze, glass and water reflections and deepen blue skies. I have one for my big lenses and one for the 50mm. Dolica CF-NDK77 77mm 0.3, 0.6, 0.9ND Neutral Density Filter Kit – this is the kit of filters I used to photograph firework shows at Walt Disney World. These filters will help in your landscape and waterfall photography, too. Step Up Rings – why have filters to fit each of your different sized lenses when you can use step up rings to fit bigger filters onto smaller lenses. Saving both money and space. Photo Management Software: digital photography means thousands of images to store, manage and edit. Thankfully, these two software packages make it much easier and faster to do so. For both PCs and Macs, Adobe Lightroom CC – the best choice for photo management of large collections of photos. For plug-ins for Apple Aperture, Lightroom, Photoshop and Elements on Macs, visit Macphun for their latest tools for photo enhancement, HDR, Noise Reduction and Clean up. Hope you stayed with me so far. Here are some miscellaneous items which you may find useful. Joby Gorrilapods – from small Point & Shoot to large digital SLR cameras, these handy and small tripods with flexible legs can put your camera and flashes in places you never would have thought possible. Make sure you get the right one for your uses and equipment. OP/TECH Rainsleeves – photograph in the rain without worry with these inexpensive rainsleeves. Rogue Flashbenders – these bendable reflectors have been praised by pros since their introduction this year. They are on my Wish List. Don’t forget Gift Cards from Amazon.com or B&H Photo. They make perfect stocking stuffers! Do you have any suggestions to this list? Leave them in the comments. Thanks! This entry was posted in Photography and tagged batteries, books, christmas, cleaning, filters, gifts, gorrilapods, holiday, ideas, memory, photo editing, rainsleeves, sandisk, software. Bookmark the permalink. Thanks for the ideas, Scott… maybe there is something here for my sister! A DSLR is number 1 on my list (again!) – but I know, that that it is too ambitious, so there are probably some of those things that may come on the list … – So, I’ve also (more!) time to find out which camera it should be ..??!! Oh, dear, like there wasn’t enough photography stuff on my Christmas list this year already! Yes, all great ideas.. and here’s another one: a pair of finger-less gloves for outdoor shooting in chilly weather! I bought a pair for myself today. Just a cute girly knit pair (actually 2-in-1, a pair of finger-less and a pair of regular that you can layer), but there are other ones, too, that are a little more heavy-duty. I have a pair of fingerless gloves which have a mitten sleeve that goes over the fingers. The sleeve has a magnet to keep it out of the way when need in use. Stores with hunting equipment have many types of gloves photographers could use as hunters need the same kind of protection and dexterity.